There are very few flat blocks in Pacific Heights and the 2500 block is one of the rare ones. All of the homes on the south side have beautiful gardens and most of them are vintage Victorians. 25l3 Pacific is especially charming with its distinctive interior and classic architecture. On the south side of the street, there are only 8 single-family residences. All of them have maintained their original turn of the century façades. On the north side there are only 6 single-family residences. This is one of the least dense blocks in the area. Furthermore, just around the corner is Alta Plaza Park, a full city block, featuring glorious views of the City and bay. The park has a children’s playground, tennis courts and paths for jogging and walking. Three blocks east of 25l3 Pacific is Fillmore Street featuring restaurants with some of the finest cuisine in the city. 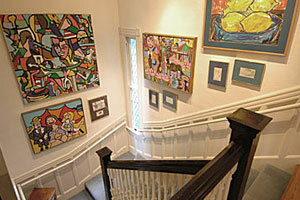 There are also boutique and antique shops, the Clay Cinema, a bookstore and various grocery and specialty food stores. Local private schools for all levels are located in the immediate neighborhood. 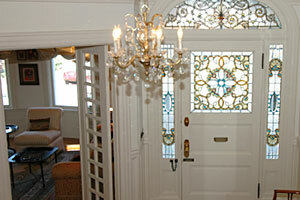 Enter the FOYER through a handsome carved wood door which frames a large prismatic, multi-colored stained glass floral scene, flanked by beautiful sidelights and an overarching stained glass transom. The foyer, with its crystal chandelier and sconce lighting, introduces much of the original finishes to be found throughout the house, including wainscoting and hardwood floors. French doors open to the charming LIVING ROOM with marble fireplace and bay windows that look out to the pretty street landscape. 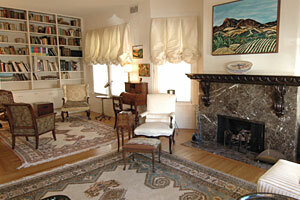 The LIBRARY/SITTING AREA with built-in bookcases provides a cozy place for leisurely reading. 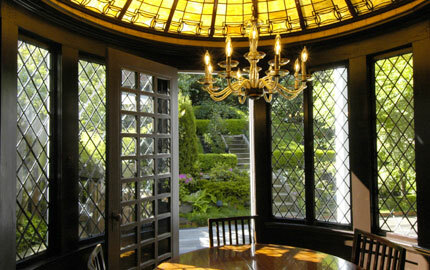 French doors open to the formal paneled DINING ROOM with beamed ceiling and gold leaf above the plate rail and between the beams. 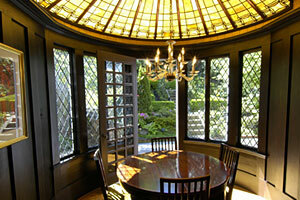 Its focal point is the exquisite ART GLASS DOME designed by the original architect. Sunlight filters through its gorgeous yellow & golden hues. The original bronze fireplace cover depicts sculpted cherubs bearing laurel wreaths. A geometric parquet inlay borders the lovely hardwood floor. Walk out to the sunny patio and beautifully landscaped TERRACED GARDEN with colorful blooming azalea, rose & camellia bushes, climber roses, an exquisite Japanese maple, large rhododendron, mature ornamental cherry trees, a quince tree and a magnolia tree and other beautiful plants. Children can revel in the delightful wooden playhouse with its third level suggesting a turret of a castle. The KITCHEN features granite counters with tile backsplash, ample storage, stainless steel island with gas cook top & ventilator, double ovens, refrigerator/freezer, instant hot water dispenser, dishwasher, disposal, compactor, and tile floor. The POWDER ROOM has silk floral wallpaper and a marble washbasin. Ascend the handsome staircase with carved mahogany posts and white spindles, past art glass side lights at mid-landing to the bedroom level. The MASTER BEDROOM features a handsome carved mantle over a tiled fireplace, bay windows and SITTING ROOM with built-in bookcases and ample closets. The MASTER BATH has a designer sink and shower over tub. 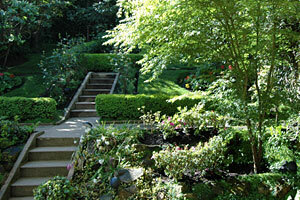 The second BEDROOM enjoys the south garden outlook. It has a coal burning foot warmer with original hammered bronze cover. The third BEDROOM also has a coal burning foot warmer (covered over) and a marble sink; the delightful SUN ROOM looks over the garden. A second floor bathroom (between master bedroom and southside bedroom) features a spa-sitting tub with shower and tile surround. The gabled, top level brings in natural light through three pairs of mansard skylights. This informal area houses the FAMILY ROOM with built-in bookcases, front OFFICE with a lattice glass window treatment, two cozy GUEST BEDROOMS with sinks, one with a shower. A separate bathroom has the original claw foot tub. Laundry room, toilet room, and 3 separate storage rooms. A one-car GARAGE (originally a family room with an old non-functioning marble fireplace still in place).